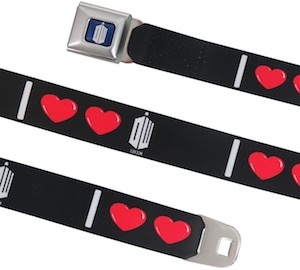 If you are a Doctor Who fan that needs a belt then check out this double love belt. A true Doctor Who fan already know that the Doctor has two hearts and those two hearts on the black Doctor Who belt now make total sense. The black seatbelt style belt has a chrome buckle with the Doctor Who logo on it and that is also a button to open your Doctor Who belt. On the black fabric you can find an I then two hearts and then the Doctor Who logo and that spells out “I Love Doctor Who”. Now would be a great time to keep your pants up. Female Doctor Who fans that want a fun jacket should check out this Tardis and logo varsity jacket. The women’s jacket is mainly black but one front jacket panel is Tardis blue. On the front of the jacket you can find a big Doctor Who logo that looks like the Tardis and on the sleeve it says “Doctor Who” in a painted look. And to make this Doctor Who varsity jacket even better they added a big Tardis to the back and you can see it by clicking on the picture. You can get this Doctor Who jacket in many women’s sizes and it is made from 80% cotton and 20% polyester. Now you can have a Tardis t-shirt with the new logo on it so come check out this Tardis and the new logo t-shirt. 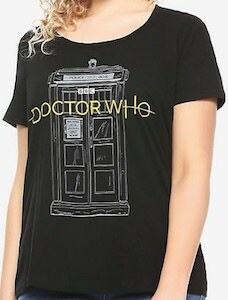 The women’s t-shirts is black and available in many colors and on the t-shirt you can see a drawing of the Tardis and on top of the Tardis you can find the yellow 2018 Doctor Who logo that simply says “Doctor Who” but with lines in it so that it looks like the Tardis just flew through it. A Doctor Who t-shirt like this is great looking and special and that should be making this the perfect t-shirt for you. If you like to add some Doctor Who to your kitchen then why not start with a set of Doctor Who logo tea towels. The tea towels comes in a set of two and they are white and on it you can see blue circles and in the middle you find the famous Doctor Who logo that spells DW and that looks like the Tardis. The Doctor Who kitchen towels are made from 100% cotton and measure 12 x 8 inches. A set of Doctor Who towels like this will look stunning in your kitchen just hanging around or to be used to keep your hands and the dishes dry. If you want a fun Doctor Who mug then this mug is what you will like. It’s a stein style mug that can hold 20oz of your favorite drink. 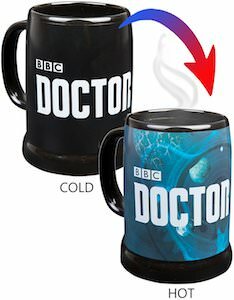 The mug is black with on it the BBC Doctor Who logo and then when you put your favorite hot beverage in it like coffee or tea then the black background will change to a blue galaxy that is so typical for Doctor Who. So why drink your morning coffee or afternoon tea from a boring mug when you can have one that changes when it heats up? Now you can eat your morning cereal from Dalek bowls. 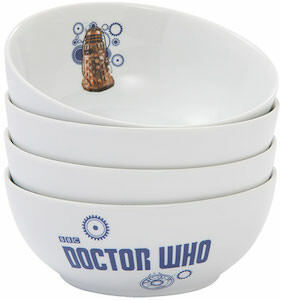 Doctor Who fans can now own a 4 piece bowl set that has a Dalek on the inside and the Doctor Who logo on the outside. The ceramic bowls are 6.5 inches in diameter and are microwave and dishwasher safe. The bowls are white and on the outside, you will find the Doctor Who logo and some gears in blue while on the inside you will find some of those gear but also a gold colored Dalek. Bowls like this belong in the kitchen of a Doctor Who fan so don’t wait too long with ordering your own set of Dalek bowls. 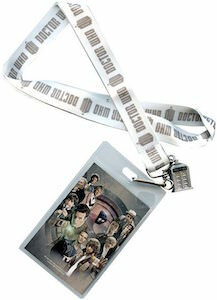 Lanyards are great ways to carry your keys and is you are a Doctor Who fan then you need to see this Doctor Who lanyard. The Doctor Who lanyard is white and has in a chrome print the Doctor Who logo and the words “Doctor Who” on it. And to make this lanyard even better they added a little Tardis charm with the key hook and they added a card pouch with a picture in if of most of the Doctor’s from the past. Now you can carry around you ID card or keys on this Doctor Who lanyard and maybe along the way find more Doctor Who fans like you. After a day of work in uncomfortable shoes you want to go home and put on these black Doctor Who slippers. These plush black slippers just are what you need for your tired sore feet and they look nice to. On the footbed of these slippers it says in big letters “Doctor Who” and on the top of the slippers it shows the BBC Doctor Who logo. And yes you can get these slippers in many sizes so that men and women that want some fun footwear for at home can enjoy them.